Description In the center of this plate, Saint Jerome clutches a stone to his breast and gazes at Christ hanging from a crucifix. A lion, the Saint’s traditional attribute, is included at the lower left. The subject of Saint Jerome doing penance was a popular one in every artistic medium in the Renaissance (see, for example, 37.1089 and 37.543). The design decorating the outer rim of the dish is typical of many plates from early sixteenth-century Deruta. The gold luster used over the whole plate was adopted by Italian maiolica painters from pottery imported from Spain during the fifteenth century. The back of the plate is painted in a bluish-white glaze. 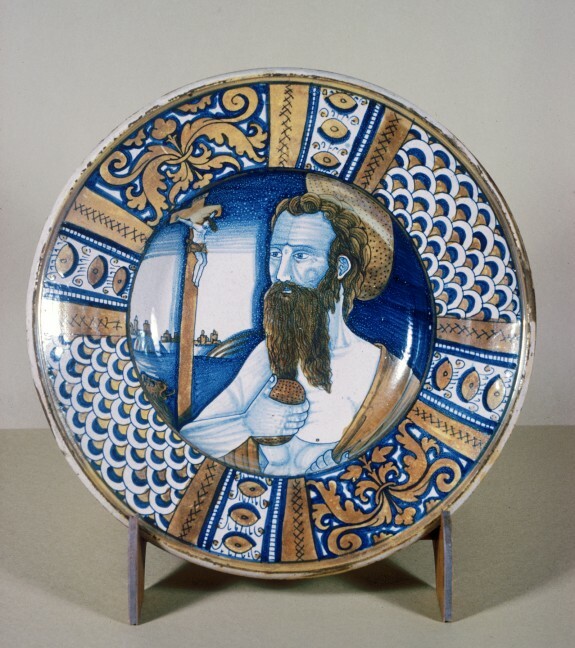 For another dish with an image of Saint Jerome, see 48.1504; for more information on luster decoration and “maiolica” see 48.1336.